A hundred thousand lemmings can't be wrong! “It’s a what?” It’s a Swing Wing! Because “Self-induced Whiplasher” just wouldn’t sell as well, you know. But that’s not all! We also had Clackers! What fun! What hilarity when those things busted into pieces and flew in all directions. More thrilling than lawn darts! And they say only video games cause brain damage. It really underscored to me how big and diverse the blogosphere has become. There were lots of big bloggers I barely knew of, because they’re in areas I don’t follow. Some tech folks were telling me that they liked it because, going to the tech conferences, they saw the same people every time. I think a lot of political-blogger types felt the same way. There was plenty of cross-fertilization. But the bottom line is that the blogging pond has gotten very big, and there are a lot of big fish in it now. I think that’s a huge success for the blogosphere. I would agree and I believe the blogger’s effect on news and information is still defining its self. Just two years ago there were a handful of blogs I kept up with on a daily basis and of those I pretty much kept up with all the posts and comments. Of that handful, just two remain that I follow that closely: Instapundit and Tim Blair. I still tune in now and again to many of the old favorites, such as Althouse, Hot Air, Gateway Pundit, Iowahawk, The Anchoress and the Advice Goddess. But the time that had been spent keeping up with the second tier blogs has been supplanted by time spent at a variety of excellent blogs related to my business and industry. Two years ago, there wasn’t much out there in the blogosphere related to my business. At least not much beyond the posting of code samples, requests for technical support and rants against Microsoft and such. Today, there are a number of excellent blogs related to software design, development and security. Joel Spolsky and Bruce Schneier are no longer such lonely examples in the blogosphere. The adaptability of the blogosphere, where evolutionary rules prevail more so than the revolutionary, is not its only advantage over the legacy media. The blogosphere, I believe, will host a diversity of which the politically correct congregation cannot even conceive. When an environment of diversity exists without fear of reprisal or repression by guilt, there can be true dialog and understanding. In the blogosphere there are no suicide bombers to be fearful of, entitled, unfocused hunger strikers receive the collective yawn and laughter they deserve, lies are exposed, and justice prevails. In the legacy media, you’ll find support of terrorists tactics (bombers, snipers, use of human shields), exaggerated importance of trite stories, fabrication, lies, bias disguised as journalism and efforts to incite lynch mob frenzies among their readers. True, you may find this among bloggers. But other bloggers will expose such bloggers. Legacy media does not do this to its own. I have great faith in the general population’s distaste for being duped like this and judging from the falling circulation and stock prices among the major US papers as well as the anti-war bombs being cranked out by Hollywood, I’d say the general population is catching on to what a shabby product the legacy media is producing. And for those that see, the blogosphere is there to catch them. I studied French for 5 years and used it only twice in my life for actual conversation. 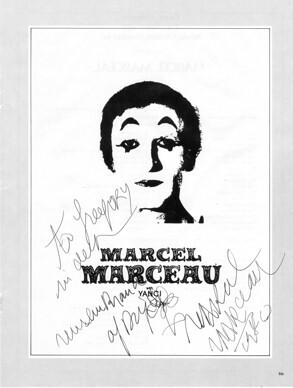 Once while traveling through Canada and once after waiting near two hours at the back entrance of the theater for Marcel Marceau. 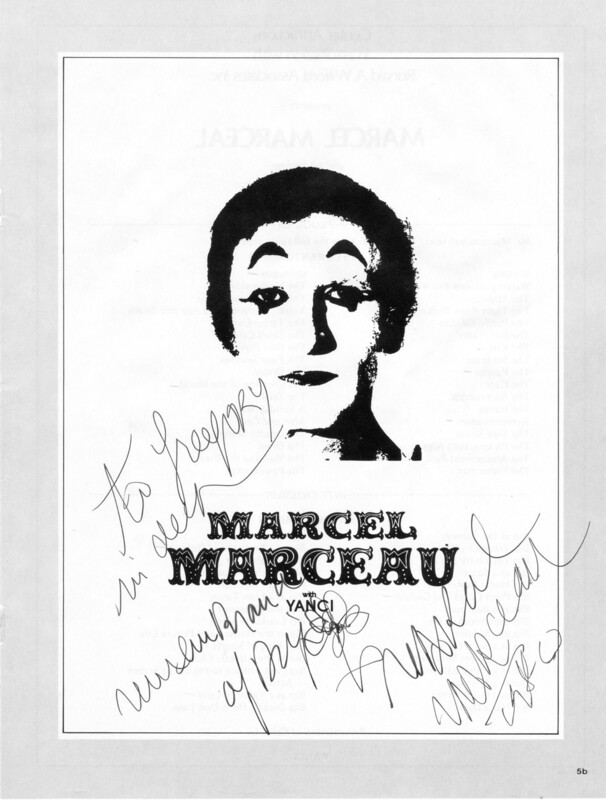 I told him, in French, that I thought his performance was fantastic and asked for his autograph (Yes, I have spoken with the mime! ), which he gave. Still a memorable performance and an inspiration after more than 27 years. I was saddened to hear of his passing. That’s where I am, at the moment. 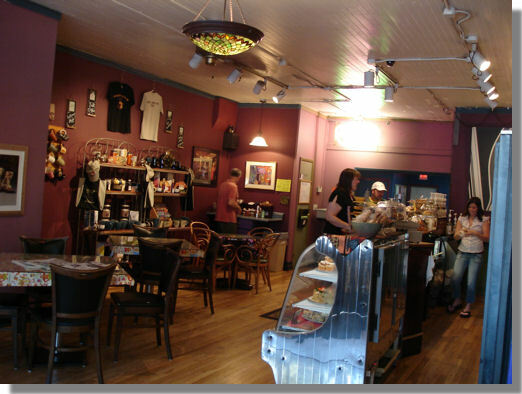 The “Soul Full Cup” coffee house on Market Street in Corning, New York. It has it all – ambiance, WiFi, and most importantly, excellent coffee. A special shout out to my nephew, David. This is his favorite place to enjoy a cup of java and many thanks for sharing the wisdom. At 20, the man has soul. True, dat. I’m waiting for my connecting flight to Rochester and United is delayed because of some sort of system-wide computer glitch. I have yet to get through this airport without a delay. CNN is spewing info-filth into the waiting area. So far in the “news”: Firemen are dead, a mother and baby are dead, a truck plowed into pedestrians, an ambulance crash was caught on tape and there has been a raccoon rescue. Not feeling particularly informed here. One thread of solace, via GPRS I can connect to the real world. and we look forward to our next opportunity to serve you. Hmmmmmm. Do you suppose anyone lost their job?